It’s crazy to think that it has been almost ten years since the first licensed property LEGO game, LEGO Star Wars, hit store shelves to the skepticism of more than a few gamers. Sure, there had been LEGO games on the PC in the past, but most of these were limited to simpler themes like racing or mining. Fast-forward to 2014 and we now have full-fledged LEGO games for Indiana Jones, Harry Potter, Lord of the Rings, Batman, and most recently, Marvel comics. And boy, has the series changed dramatically from what it began as. 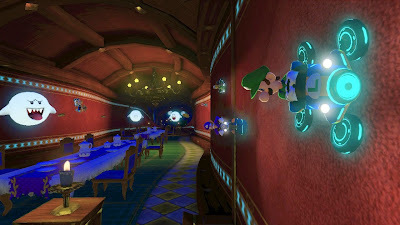 It’s true that the core mechanics of building objects and solving ability-specific puzzles within each level remains largely unchanged, though the sheer variety is impressive. Psychic characters like Jean Grey can lift or alter portions of the environment, Electro and Arnim Zola can charge generators, the Human Torch can melt golden bricks, Hulk and Colossus can tear down barriers marked with green handles, Magneto can manipulate metallic switches, Captain America’s shield can be thrown at rotating locks, anyone with a Spider-Sense can reveal secrets hidden within the immediate surrounding area, Wolverine can dig up treasure – and these are just their abilities for overcoming in-level obstacles. As far as combat goes, each character’s offensive capabilities ring quite true to their comic book origins, though it is effectively a repetitive process of mashing the same few buttons to take down goons – nothing too complicated, given the intended age range for LEGO games. While puns and inside jokes referencing the films and comic book realms (even some pop culture reference aimed at older gamers) are all fine and dandy, the real reason this LEGO title trumps many other Marvel video games is the insane number of characters that can be unlocked – over one hundred in total, from the obvious headliners like Iron Man, Spider-man, Hulk, Thor, and Captain America, to old-school villains like the members of the Sinister Six and Red Skull, to the more obscure Black Bolt, Leader, Silver Samurai, and Squirrel Girl. The overall presentation treads a fine line between classic comic book plotlines and the polished, real-world character and environment designs of the more recent Marvel Studios films, which makes for a smart marriage that kids and adults will similarly appreciate. The story is largely focused on Dr. Doom and Loki as the two main villains – Doom wishing to utilize Cosmic Bricks as an energy source for a new ray weapon, and Loki being his usual mischievous self while simultaneously helping to recruit and set loose other villains on the Marvel heroes. Each stage highlights a different set of heroes, none of which are guaranteed to be from a previously identified ‘canon’ team. True, a couple of missions put you in control of the Fantastic Four and the X-Men respectively, but others, such as a trip to Asgard, see Thor team up with Captain America, Wolverine, and the Human Torch. All around this LEGO rendition of New York City, players can participate in races, square off against heavy foes like the Sentinels, take pictures for J. Jonah Jameson, collect studs aplenty, and complete other challenges to unlock both gold bricks and extra characters. Meeting a certain number of golden bricks will open up more of Deadpool’s bonus mission, which see the merc with a mouth narrating his own action-packed tales featuring quick but enjoyable scenarios with Spider-man and Iron Man halting Electro and Shocker’s latest attempt to rob a bank and Captain America and Daredevil going toe-to-toe with Kingpin. Deadpool’s humor has been toned down for a younger audience, but his signature style still holds true, thanks to the voice talents of Nolan North. In fact, the voice acting throughout does a solid job at providing each character with his or her own unique identity. While other veterans return to reprise their roles, including Steve Blum as Wolverine, the only voice actor from the films who chimes in is Clark Gregg as Phil Coulson. That said, the voice actors who lend their talents for Nick Fury, Tony Stark, Thor, and so on, provide convincing performances that clearly pay tribute to their movie-verse counterparts while also adding a dash of their own take on these iconic heroes. The soundtrack, meanwhile, pays painstakingly obvious tribute to tunes heard in the Avengers film, and graphically the game looks about as polished as anyone could hope for a game built entirely by digitally-rendered LEGO bricks. The glossy textures and bright lighting effects play off one another well, while bright colors of superhero costumes stand out against the backdrop of nearly every environment. LEGO Marvel Superheroes is a bit on the easy side, which is only to be expected, given the family-friendly appeal of the game. But no one would argue there is a lack of things to do, as completing the roster alone will require plenty of extra time collecting the necessary studs. Players can revisit stages in Free Play mode to tackle challenges and explore new areas that were otherwise unaccessible with the default characters. Every second of the game provides something amusing, from silly dialogue of pedestrians to the flash and flair of the good vs. evil narrative. 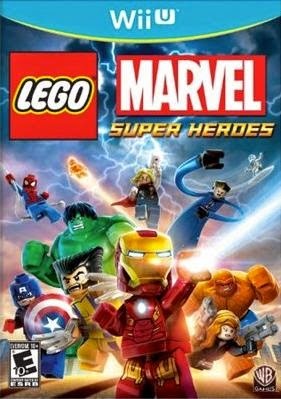 The LEGO games have held a pretty consistent track record in terms of their quality and appeal since they first debuted, but this may very well be one of the most polished Marvel games to date. Following up on the new underwater and flying elements introduced in the 3DS release of Mario Kart 7, the Wii U’s Mario Kart 8 adds a new kart transformation into gravity-defying hovercraft. Now racers can ride along walls and up steep inclines, while riding right up alongside a rival racer will grant a mutual speed boost, thanks to the horizontal position of the wheels. 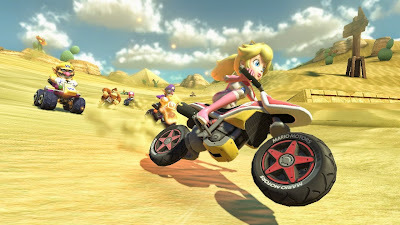 Each of the sixteen new tracks incorporates all four of these race styles quite evenly throughout, while reimaginings of tracks from Mario Karts of yesteryear tend to focus on implementing one or two of these newer features. The 3DS tracks see the least change, as that was the title that first properly introduced these kart transformations, but the DS Wario Stadium sees a brief wall-climbing section added to the familiar dune hops, and the simple act of widening the paths on tracks from Mario Kart 64 benefits the experience greatly. New items include the Piranha Plant, which behaves in a vaguely similar fashion as the Chain Chomp previously did, though this potted monstrosity will provide a few gradual speed boosts as it nips at rival racers and reaches for coins that are just out of its user’s reach. 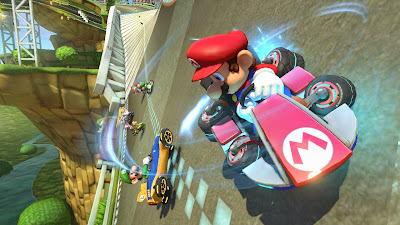 The boomerang grants players three tosses, while a new horn item – despite being a rare pick of the bunch – ends the legacy of the blue shell being the end-all be-all solution of taking out the racer in first place. All in all, these new items fit well with the classic shells and banana peels, and the item blocks tend to respawn faster than in previous Mario Kart titles. Also sped up is the recovery time from falling off the track. This, combined with the less extreme ‘rubber band effect’ of the AI suddenly catching up to player-controlled racers at the front of the pack, makes for a more enjoyable experience overall. At the end of the day, it really is about racing skill and item management more than the CPUs getting lucky at the last possible second and stealing first place. That’s not to say that the tracks are a cake walk (or Sunday drive, as is perhaps the more appropriate metaphor) – there are plenty of cool design features implemented, such as wavy walls in a Boo-infested mansion, and rolling stone wheels within a temple that takes more than a bit of inspiration from Indiana Jones. There are times that Mario and friends will be upside-down, and paying attention to how fast you’re headed around that next turn is crucial. Graphically, the game is a sight to behold, with lighting effects that cascade over metal track portions as convincingly as they do through snow-covered pine trees. The soundtrack, while still classic Mario Kart fanfare, takes a notably more jazzy approach this time around. The aforementioned coins do nothing to benefit players in the midst of a race, but rather are the means for unlocking new vehicle option parts, including bike and kart frames, wheels of varying sizes, and colorful gliders for the flying portions. Earning gold in the three Grand Prix difficulty settings will reward players with new characters. Admittedly, a decent portion of the roster is represented by the Koopalings, and while they have been brought back into the limelight in recent Mario titles, including half of them in Mario Kart 8 would have sufficed. There are a couple of surprising additions to the roster, but for the most part, it’s the usual suspects – though there certainly isn’t any shortage of weight classes and racer styles to choose from. This Wii U Mario Kart allows players to use literally any controller setup they so desire, from the Gamepad, to the Wiimote (with or without the nunchuck), to the Classic Controller and Pro Controller. 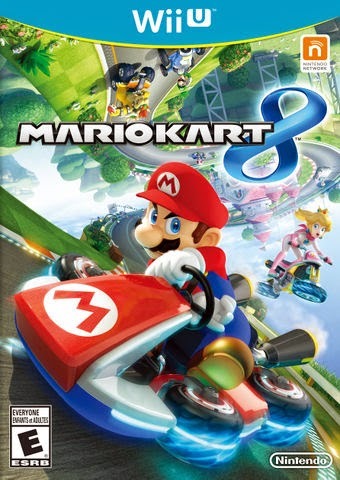 It’s a pretty ingenious strategy Nintendo has adopted with the Wii U, and allows players the freedom to control this new Mario Kart in a fashion either more akin to the previous Wii title or even older Gamecube and N64 incarnations. The battle mode is, truth be told, rather weak when compared to just about any other version of Mario Kart. The fundamentals remain intact, but there are no battle mode-specific stages in Mario Kart 8. Instead, the game has you and your friends duking it out with CPU characters on the regular race tracks, and while the three balloon life system works just as well as before, the insanely large areas of these tracks robs the battle mode of much of its strategy and fun factor. Despite this one significant misstep, Mario Kart 8 is an otherwise solid entry in the long-running series. It’s not groundbreaking by any means, and frankly, many of its successes are owed to the 3DS and Wii titles which preceded it. But it builds off the groundwork enough to feel the part of a worthwhile addition to the series. And it is a lot of fun, which is really what a good kart racer should be.